Below is a selection of some of my favorite men’s patterns from my design line. 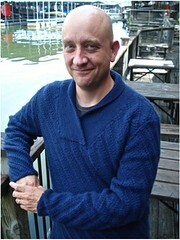 For a more complete showcase, visit my Ravelry designer page. You know that single skein of yarn in your stash that’s made of luxurious fibers (cashmere, alpaca, qiviut, yak down, angora…)? It’s calling your name, but whatever will you knit with it? This hat—which suits both men and women—lets all the gorgeous qualities of those luxury yarns shine. My dad is an avid bow hunter: he takes such pleasure in spending fall and winter mornings in a duck blind or up a tree. He doesn’t shoot much—just enough to eat and to donate to a homeless organization in town—but he does love to be out there enjoying the world. These gloves are designed to wear on those days: pointer finger and thumb free, while the other fingers snug warmly together in a modified mitten. The cuffs are extra long so the gloves stay tucked inside a coat or sweater. Classic styling mixes with a few off-beat details so that this sweater is both fun to knit and easy to wear. 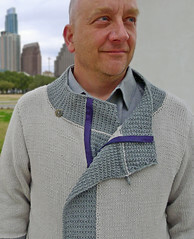 Top-down saddle-shoulder construction and a zipper that slants across the front make interesting knitting, while the lightweight, recycled-fiber yarn suits men’s higher body temperatures. Apart from the top part of the yoke, which requires close attention, the rest of the sweater is easy, quick knitting and requires no seaming. The WiFi Hat – suited to men and women – lets you have the look of cables without the cable needle. (Thus the punny name: this hat has all the fun of cables without actual cables – just like wifi!) This hat’s attractively hemmed brim means no interruption to the color work. If this is your first time trying stranded knitting, you will find plenty of tips in the pattern to help make your first color project a pleasure. This zippered cardigan’s asymmetrical fronts, long cuffs, and oversized cowl collar derive straight from men’s runway fashion, while the fitted shoulders, hip shaping, and roomy body flatter the masculine silhouette. 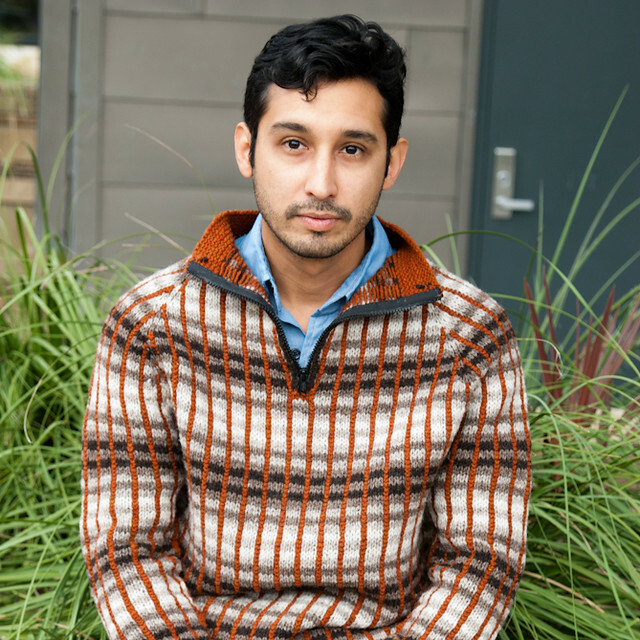 This raglan pullover looks dashing and is easy to make. The honeycomb pattern on the body of the sweater is a simple combination of knit, purl, and slipped stitches. The body and sleeves are knit in the round separately and joined at the yoke. The body and sleeves are then worked all together from armpit to neck, which leaves mere inches of seaming to be done at the end of the project. Men’s pullover knit in the round from the top down with raglan shaping and a steeked zipper opening. When I first saw Jared Flood’s yarn Shelter, I wanted to create a design that looked rich and complex but simple to knit. 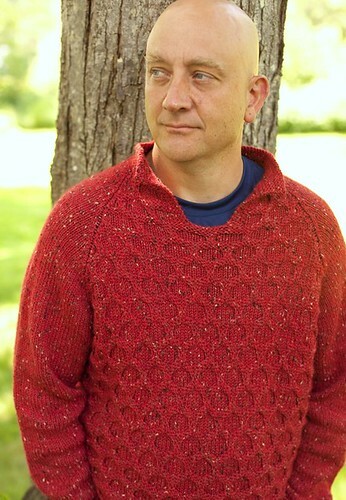 The yarn’s loft makes the sweater much lighter than a stranded sweater normally would be. The shape mimics fleece pullovers. Available from Hill Country Weavers. Most men prefer sweaters that are practical and comfortable, but a little luxurious high style never hurt anyone. The merino-cashmere blend yarn used here means this sweater can be worn right next to the skin. Pattern includes detailed instructions about how to work short rows and three-needle bind off, so is a great place to start if you would like to learn these techniques. Do you have anything in a nice water shedding yarn with a padded shoulder for a shotgun?. I love to wear my sweaters when I’m duck hunting and could use a little padding for the right shoulder to reduce recoil from really powerful duck guns. I’d wear my waders with the overall front but would be more flexible without the heavy coat. That’s a great idea, Dad. I’ll look into it. A couple of years ago I talked to a bison yarn manufacturer that really wants more hunting/outdoors-friendly men’s sweaters, so they’d be the perfect people to talk to about this….